I have a personal policy to make sure I get the previous month block sent out before I let myself post the next months block. So I am really glad I made it to the post office before my toddler fell asleep in the car. 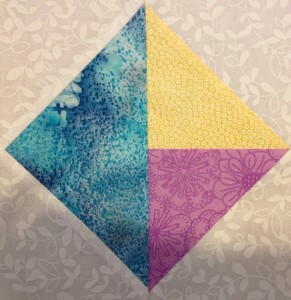 LOVE this block and can’t wait to see what the winners make with them! I only made one because my son only took 1 nap and it wasn’t long enough for 2….maybe more will come. Thank you Sophie for another good one! I love your discipline and I am impressed that you found a workaround to the problem with the iPad app. Brava! What a glorious Block Helen! Have a great weekend!